In performing your own DIY electric car conversion, there are many components that have to be included. One of the key component is the electric controller. For those who are not familiar with electric car conversion may be wandering, what is a controller? The reason for a controller is to regulate the power going into the electric motor. This is done to prevent you from stripping out the gears, blowing out your electric motor or snapping your spine as the motor tries to go from 0 to “infinity” RPMs when you flip the switch! 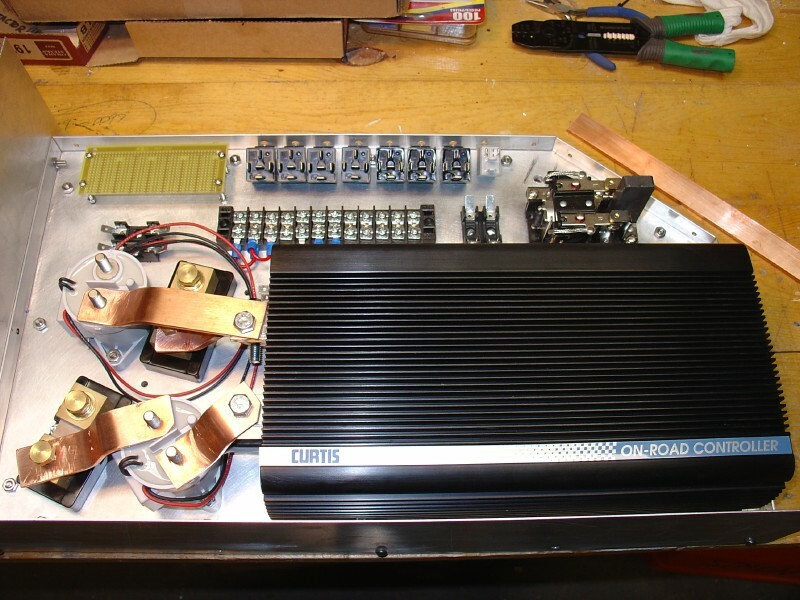 In the past, EV enthusiasts used [tag-tec]variable resistor[/tag-tec] technology to control the power to the motor. Others, mostly from the 1970s and early 1980s use contactor-driven switching to cut batteries in and out of the circuit. Modern electric controller will “pulse” the current, cutting in and out at x per second, thereby feeding the motors variable power from a non-variable source. Electric motors are basically single speed machines. It’s spinning speed depends on the power load it is given. But if you have a fixed load, and connecting the DC motor to a fixed voltage, like a battery, it will run at a fixed or constant RPM. This is not good for a DIY electric car because you have no speed control on your vehicle. Therefore, the primary function of the controller is to regulate speed. Some people will mistaken an electric controller with a [tag-tec]Potentiometer[/tag-tec]. The device is attached to the accelerator pedal, thumb throttle or handgrip. The Potentiometer feeds the necessary power input to the controller like the lever on a carburetor. DC electric motor for homemade electric car can be a menacing beast if you don’t know how to control it. When starting the DC motor from zero RPM by simply connecting it to the battery, it will cause a large inrush of current. The sudden inrush of current will cause a very large torque output from the motor. This can be dangerous if the EV driver is caught off guard. When this happens, it also put a lot of stress on the electrical and mechanical components connected to the motor, and in the motor itself. To prevent that from happening, we use the handy electric controller. Just found your site while researching info on building an electric car. Looks to be doable at a fairly low cost. The biggest problem I see so far is making heat in the passenger compartment for winter driving. Minus 40degrees for 50 minute commute to work is not fun. Also, is there any permanent magnet motors large enough to provide the power for one of these EV conversions? If there is I pray to the tool gods that it is neo. If you are wandering how to heat your diy electric car, you can check out the video at the following link –> Making a heater for electric car. It shows how Gavin Shoebridge of New Zealand did it with a homemade heater for his Mitsubishi Tredia EV. i came across your site here while researching on how to construct your own electric car. Well my program area has an old NASCAR vehicle we are going to convert into an electric vehicle. Only question, are there any other good places for how to convert a car into an electric vehicle? If the controller just varies the average voltage (by means of pulses) across the motor to control its speed, how it will affect under varying loads? Assume we supply average voltage of 20% to get the car to 20 Km-pH when the load is 50 Kg. Now the load is increased to 75 Kg and can we get it to 20 Km-pH by just supplying 20% average voltage?